The International Festival of Documentary Films on Food and Agricultural Sciences will be screening WILLIAM AND THE WINDMILL October 14 - 18th. The film will play at the Czech University of Life Sciences Prague for students, scientists, and environmentalists. Learn more about the festival on their website. WILLIAM AND THE WINDMILL will play in North Carolina on November 9th as part of the third annual Asheville Cinema Festival in the mountains of North Carolina. Director Ben Nabors is excited to premiere the film in his home state and will be in attendance for a discussion following the film. 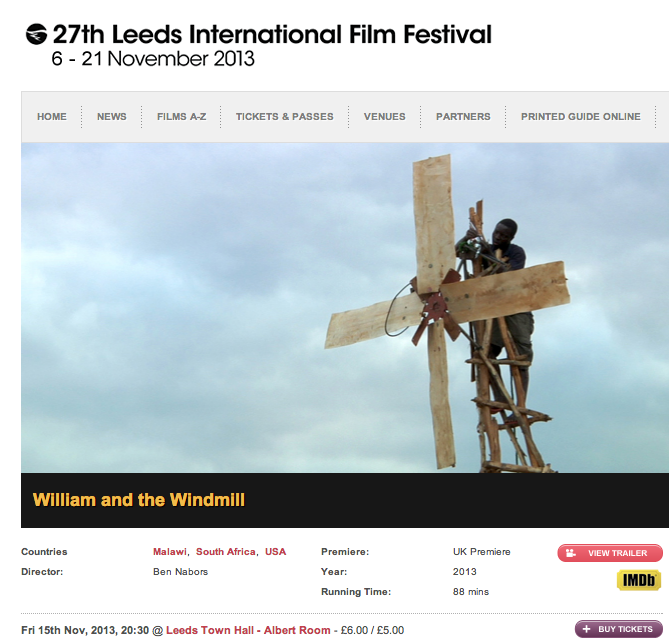 “William and the Windmill” | 95 mins. Click through for the full festival guide. The 26th Annual Virginia Film Festival is taking place this November 7 - 10 at different theaters around Charlottesville, and W&W will be playing Saturay, November 9th at the Culbreth Theater. Director Ben Nabors will be in attendance for a post-screening discussion with Jonathan Miles from the Virginia Center for Wind Energy and Paul Beyer of the Tom Tom Founder's Festival. 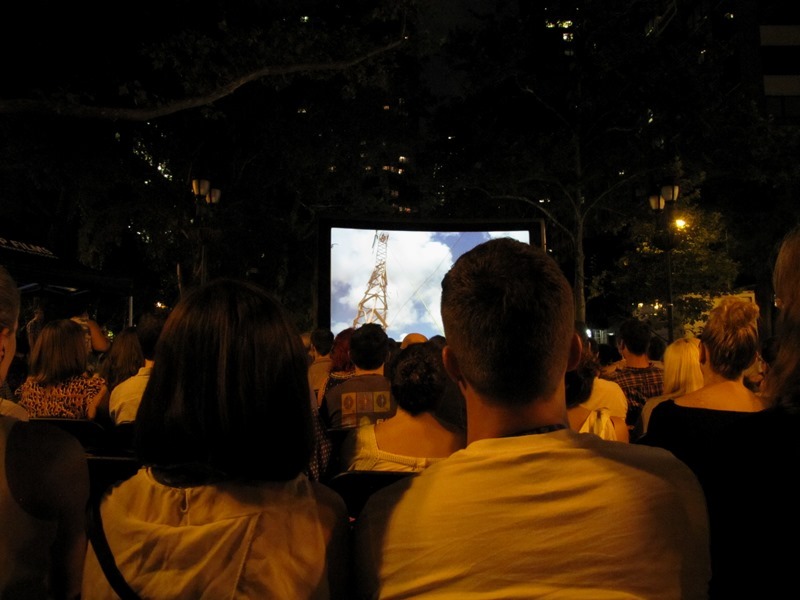 This screening is a open to the public as a free, un-ticketed event. Please arrive fifteen to thirty minutes before the listed start time to select a seat. Visit the VFF website for directions and the full schedule. WILLIAM AND THE WINDMILL is playing November 7th at the Hurricane Fine Arts Center at the Red Rock Film Festival in southern Utah. W&W will be kicking off "Hurricane Day" along with Kalyanee Mam’s “A River Changes Course,” which took home the World Cinema Grand Jury Prize for Documentary at Sundance this year. Read more about the festival in The Spectrum, and buy tickets on EventBrite. WILLIAM AND THE WINDMILL is playing this week at the University of Iowa in collaboration with their University of Iowa Center for Human Rights. This week, Ben Nabors is in Iowa City to screen his new, award-winning film, “William and the Windmill,” which also is based on Kamkwamba’s story. The first of two screenings took place Tuesday on the University of Iowa campus. The second will begin at 6:30 p.m. today in West High’s Little Theatre, 2901 Melrose Ave. Nabors will be on hand afterward to answer questions. This week’s screenings of Nabors’ documentary can serve either as a capstone to the discussions of the book that already have taken place or as an introduction for local adults and children who have yet to begin reading Kamkwamba’s story. Read more in The Press-Citizen. 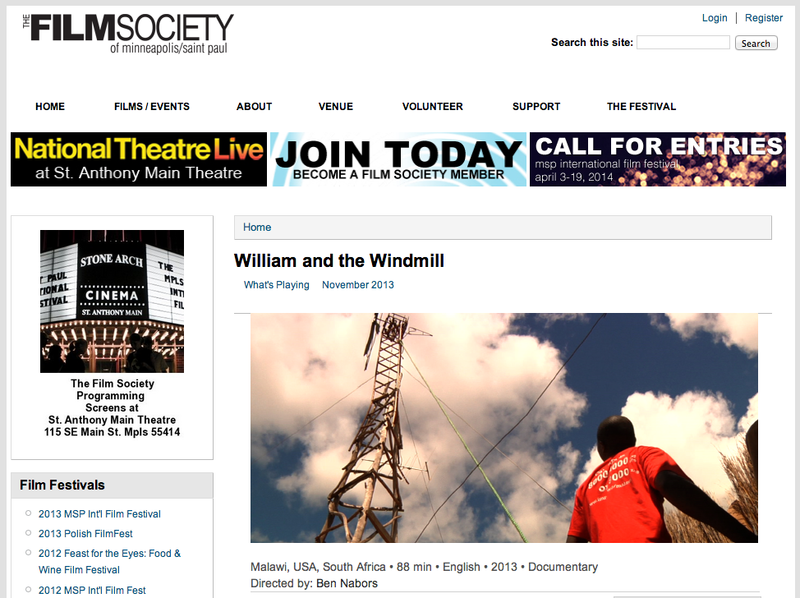 WILLIAM AND THE WINDMILL played next to some outstanding films this weekend at both the FlyWay and New Hampshire Film Festivals. 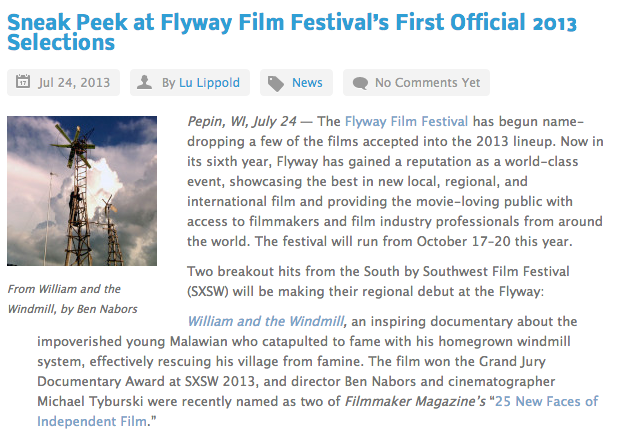 The film was presented with the Best Documentary Feature award at the Flyway Film Festival. The award itself is the iconic FlyWay Ax, a stone sculpture designed by nationally recognized local artist David Culver. Ben Nabors also sat down for a short interview at the New Hampshire Film Festival to talk about the film. Watch below. WILLIAM AND THE WINDMILL has been selected for the documentary showcase at the first La Costa Film Festival in San Diego, CA. It's screening Fri, October 25– all proceeds go to the Boys & Girls Club of Carlsbad. Greentopia | FILM is a collection of films that inspires and transforms, and ultimately empowers the audience to create sustainable changes in their own lives and communities. 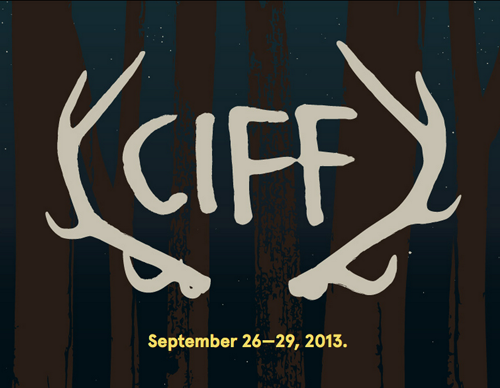 The 2013 edition of the festival will feature six days of primarily non-fiction films, pre-ceeded by lively buskers and other artistic performances and followed by engaging, challenging, and stimulating panel discussions. The goal of the MIBFF is to bring audiences the most beautiful and the most amazing new Black films, while creating a space to debate major cultural, social and socio-economic issues. The MIBFF wants to promote a different kind of cinema, cinema that hails from here and from abroad and that does not necessarily have the opportunity to grace the big screen, groundbreaking cinema that moves us, that raises awareness and that takes us all by surprise. WILLIAM AND THE WINDMILL is screening this Saturday at the Nevada City Film Festival, 6:00 PM at Miners Foundry- Osborn & Woods Hall. Director and Producer Ben Nabors will be in attendance for a post-screening Q&A. Click through for tickets.